At Frontier Basement Systems, we can provide a variety of solutions to help you upkeep your home's flooring, preserving its beauty, value, and functionality for years to come. Meet with one of our professionals to see what we can do for you; we're ready to help! We offer free quotes for a variety of related services within the Jackson, Nashville, Clarksville, Bowling Green, Murfreesboro, Owensboro, Utica, Fayetteville, Marion, Philpot, Mcminnville, Franklin, Leitchfield, Shelbyville, Hartford, Antioch, Paducah, Tennessee and Kentucky service area. Call or e-mail us to schedule an appointment! Cupping occurs in wood floors when the edges of the boards are higher and the center is low. This is a sign that the moisture levels in the wood are uneven from top to bottom. Specifically, it happens when the wood is wetter on the bottom of the board than on the top. As the wood expands with moisture, the boards are crushed against each other, causing the edges to lift upwards. At Frontier Basement Systems, we pride ourselves in our quality, long-lasting solutions for moisture problems of all kinds. To preserve your wood flooring through proper moisture management in your home, or you'd like a waterproof solution for your floor, we have just what you're looking for! 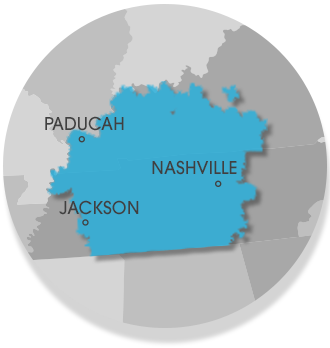 We proudly serve the Tennessee and Kentucky area, including Clarksville, Nashville, Jackson, Owensboro, Murfreesboro, Bowling Green, Philpot, Utica, Fayetteville, Marion, Mcminnville, Franklin, Leitchfield, Shelbyville, Hartford, Antioch, Paducah and nearby.